Holiday decorating has started! I wanted to do something simple, yet fun in the grand foyer. The window treatment I had in place before just wasn't working. The colors were right but the pattern was too much for the space. I've been playing with different options. My plan is to sew my own window treatments but finding just the right fabric is proving a challenge. I was recently given a copy of a 1985 holiday craft book. Let me tell you, the puffy paint holiday sweatshirts were amazing. There were a few good ideas that provided inspiration for me. . . Along with a need to cover up the plain red curtain. The red just wasn't doing it alone, so I added a longer black fabric and used the red as a "trim." From my big bucket of holiday bows, I grabbed these Santa bows from last year's tree and tacked them down the side. I experimented with the bows on green and red curtains but they just blended in. My original preference was just black drapes but well... Last minute project and clearly not enough fabric. As it turns out, I do like the pop of red on the bottom. 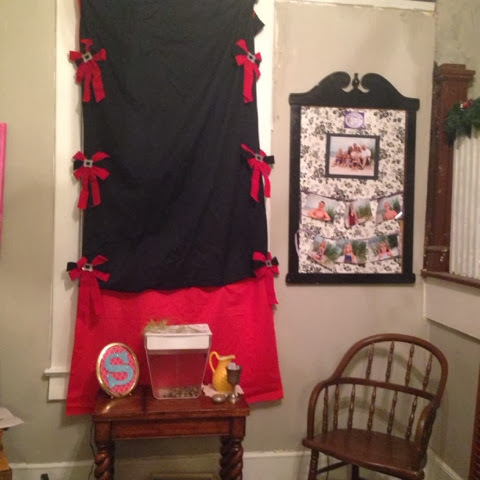 Adding the bows to the side is a fun and temporary way to add holiday to your windows! Love the look! Do you miss not being able to see out?